Many people requested me to make a rice burger! Of course you can change the filling but I think Yakiniku is easy and goes great with rice ;) Enjoy!!! 1. Mix A in the cooked rice, then knead with a rice paddle until it gets sticky. Divide it into 4 portions, wrap with plastic wrap and shape each into a flat round shape. 2. 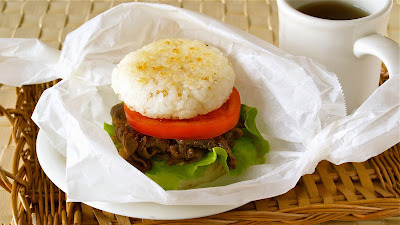 Heat sesame oil in a frying pan, then cook both sides of the rice burger buns until golden brown. 3. Layer the rice, lettuce, mayonnaise, Yakiniku, sliced tomato, and rice to serve. It is easy to eat if you wrap with parchment paper.